I upgraded to Firefox 2.0 recently and was impressed like most other folks. Things were fine until I started noticing excessive hard disk activity as well as sluggish performance and intermittant hangs. Task Manager showed Firefox using ridiculous amounts of memory, more than 300MB with several open tabs in multiple windows. Considering my wife and I use separate windows for our work, quitting and restarting every day is not convenient since Firefox only restores the session of the window that was closed last. I was only using Google Toolbar to auto-fill my forms so it wasn’t hard to uninstall it. 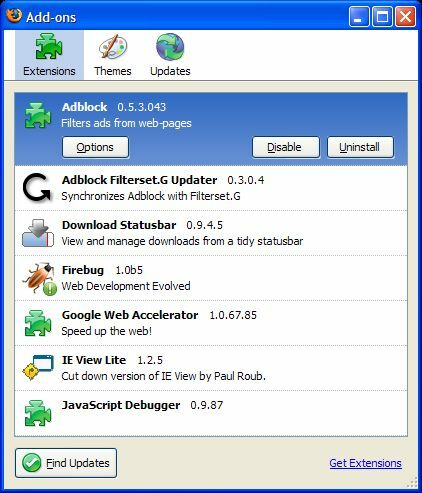 As for IE Tab, I installed the recommended alternative IE View Lite which is a sufficient solution. Having IE embedded into Firefox is a nice to have but not essential. From that point on, Firefox memory usage has stayed under 100MB for the most part. After several days of usage spanning multiple tabs, windows and websites, it gets to 140MB which is pretty reasonable compared to the original 300MB. There’s more tips for reducing memory on this Mozillazine page if you are interested in further improvements. here is a link that would further help you bring down the FF mem usage. The easiest way around is updating to ff 3, beta 5. No more memory leaks. Good info and well presented, for more quality free info on pc security related issues have a look here.